The first and most important examples of architectures using the wind as a cooling medium to improve indoor environmental conditions are found in Persian traditional architecture, the badgir (or mulqaf in arab) is an extraordinary piece of spontaneous design, using only the natural flow of the wind – often combined with many other bioclimatic arrangements like thick insulating walls, very packed constructions, small apertures, etc. – it is capable of cooling and improving the climatic comfort of a house in the torrid deserts of Iran and the Arabic Peninsula. The badgir, in arid and dry climates is often combined with the use of water to implement evaporative cooling improving even more its cooling capacity and generating cool breezes even without the presence of winds outside, in this case the thermodynamic effect is not based only on ventilation but also on convection. The windtower, or literally windcatchers, can be found as a traditional element in most of the modern Islamic world area with few regional variations, its usage has been consistent through the ages but in the western gulf region it almost disappeared due to the rapid urban growth and modernization of the cities, in Bahrain, for example, only one ancient badgir remains. 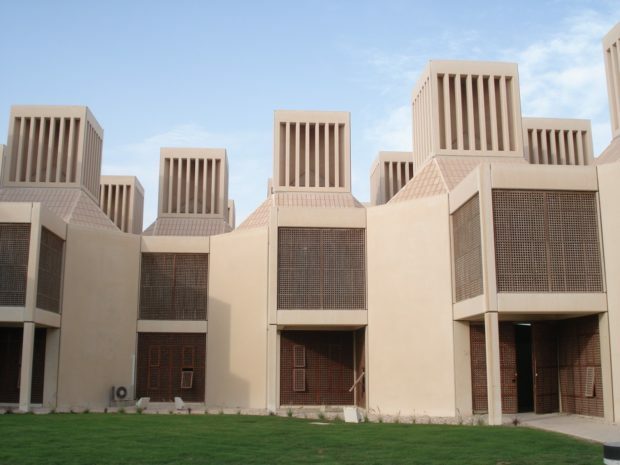 The traditional usage of windcatchers has been nowadays reinterpreted in many ways using both natural and mechanical aided ventilation, the great Egyptian architect Hassan Fathy used it widely in his buildings, but for sure, one of the best practice (at least if we consider this research public-space oriented) is the Qatar University Campus designed by the Egyptian architect Kamal el Kafrawi (with the collaboration of Ove Arup) and opened in 1985. 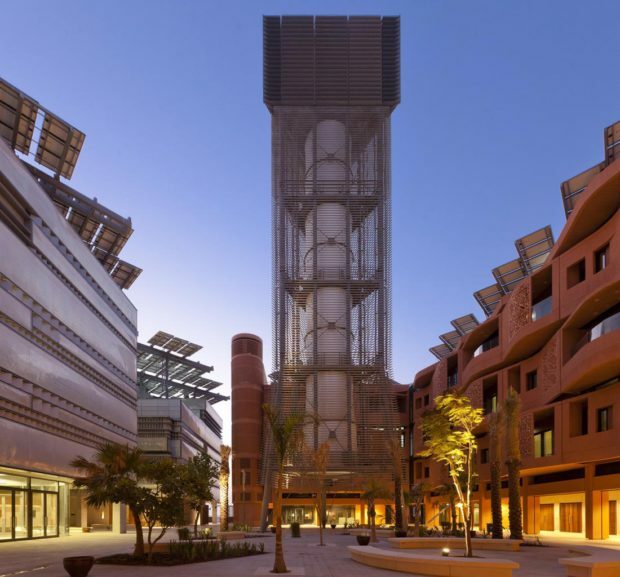 In this groundbreaking project the use of windcatchers is systematic and characterizes the whole campus. 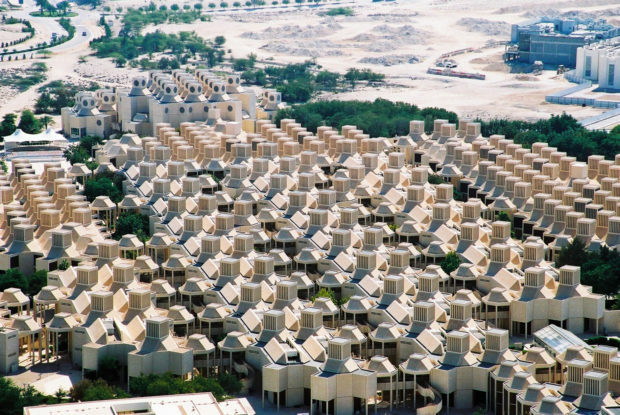 Based on an octagonal and square plan geometry, the low rise concrete modules the projects makes large use of natural light and natural ventilation through the hundreds of windtowers that top every module and mashrabiyas to protect the classrooms from sunlight and permit the air circulation. The aggregation of the modules juxtapose classroom modules, halls and rest spaces enriched with vegetation and constantly ventilated through the roof. 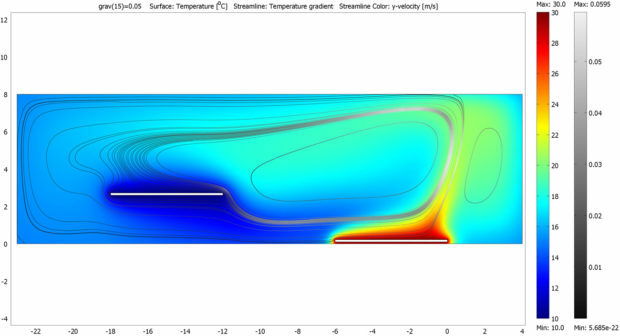 In contemporary architecture, and specifically in the climatic improvement of public space, the use of ventilation devices, especially in high-humidity environments is quite a new thing and mechanical ventilation is generally used as a cost-efficient way to overcome tropical humidity especially in southeast Asia. 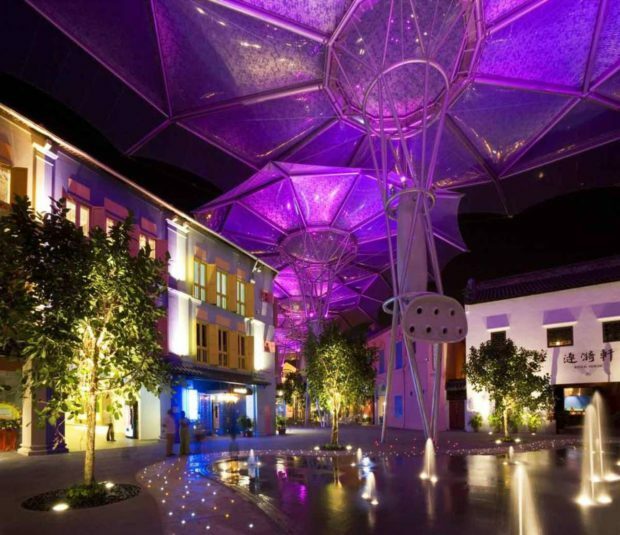 Two projects are to be considered references in this case, one is Will Alsop’s Clarke Quay in Singapore and the other is Ecosistema Urbano’s Air Tree for the Shanghai Expo 2010. 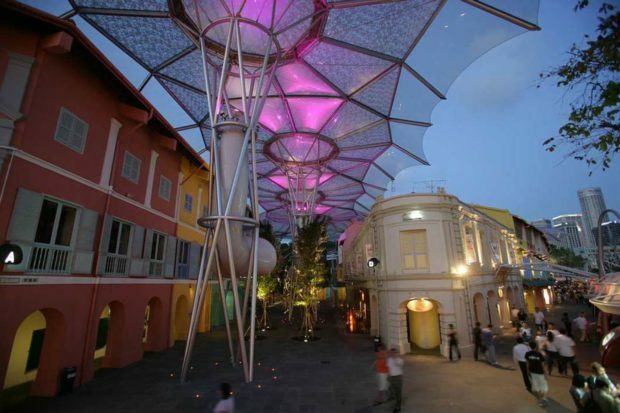 In this 2006, project, Alsop is called to regenerate the Clarke Quay riverfront and the market with the objective of drawing tourists and locals back to the old Singapore’s waterfront. The most interesting thing of this bold design is certainly the bioclimatic intervention in the market, refusing to create a closed shopping mall the architect designed a mitigated semi-external space, protected from frequent rains and with improved environmental conditions. Clarke Quay Redevelopment, Singapore. Image courtesy of Will Alsop. The market intervention is composed by two main parts, the roof and the ventilation devices. The roof is constituted by giant umbrella-like structures covering the internal streets of the market, the ETFE canopies covering the streets offer protection from both the rain and solar radiation that in this climate are equally detrimental for the use of public spaces. This roof maintains the temperature in the central square and the four streets of the market at around 28º Celsius when outside temperatures can rise up to a mean of 31ºC. But the most important and innovative feature are the “whale-tail” shaped ventilators placed in the vertical supports of the roof structure. These big fans have a fundamental role in maintaining good environmental conditions in the market streets, considered the high relative humidity level(year average 84%) ventilation is the only way to make the air tolerable. Using slow rotation fans these sculptural objects blow a constant breeze in the lower part of the market favoring the natural evaporation cooling of the skin. The Air Tree that Ecosistema Urbano realized in Shanghai for the 2010 Expo is a prototype of an intervention in contemporary urban space. It is conceived as a new kind of public space, a technological urban furniture, which also serves as a virtual node of connectivity where users can actively interact. Its different technical layers enables multiple final configurations and a myriad of intermediate positions (opaque, translucent, transparent, bright, interactive, open, etc.). Different textiles for video projections allow an unlimited combination of scenarios adaptable to citizen needs. Its appearance can be transformed over the daily cycle, as well as through the different seasons. By sensors it is connected in real-time with the climatic conditions of Shanghai, constantly adopting the optimal physical and energy consumption configuration to generate climatic comfort for the citizens. 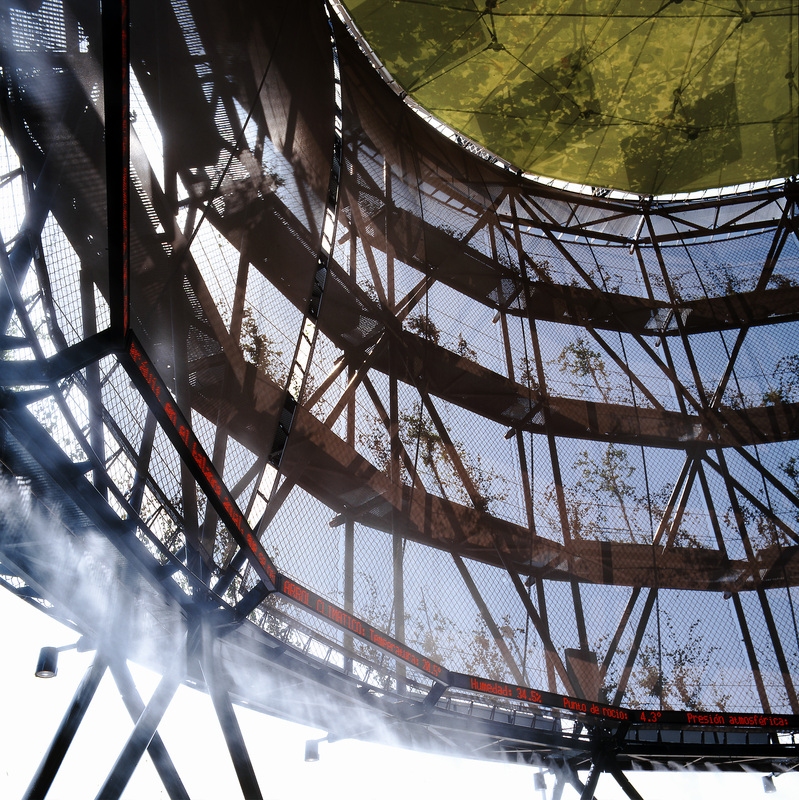 To improve climatic and environmental conditions, that in Shanghai basically have to deal with high temperature during summer and high relative humidity during all year, a 7.3 m diameter fan suspended by a tensegrity structure in the center of the space, at a height of 11.5 m provides air flows inside the space. Through a telescopic system the fan can be lowered several meters to come closer to the ground. The exact position and speed at each moment is determined according to the instant climatic conditions of the environment, real time monitored in the surroundings of the structure. Together with the variable configuration of the tree’s skin the flow of air generated with the fan can effectively improve the environmental conditions inside the tree. In this short post we are going to present some projects that we consider interesting because of their use of shadow or shadowing devices, we tried to stick to projects that make use only (or mainly) of the shadow leaving other mixed projects for later. 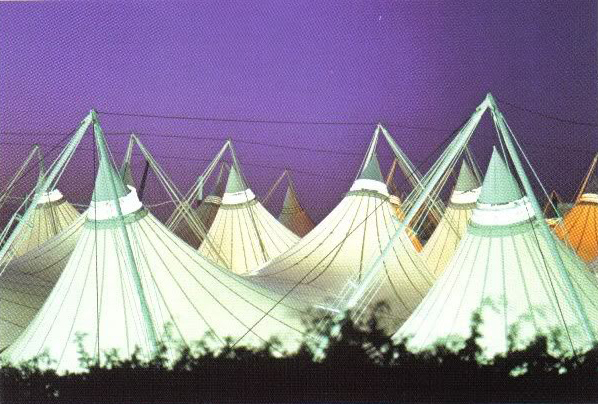 The whole structure covers more than 42 hectares (60 football fields), and it’s composed by 210 tent-shaped cones made of Teflon coated fiberglass fabric arranged in modules of 45,72m (150ft) with an oculus on the top to allow the heated air to escape. Published data demonstrate how effective the design is, reflecting roughly the 76% of the solar radiation, the structure can maintain a notable 27 ºC temperature under the tent even with temperatures reaching up to 54ºC outside providing also a soft diffused light to the whole terminal. 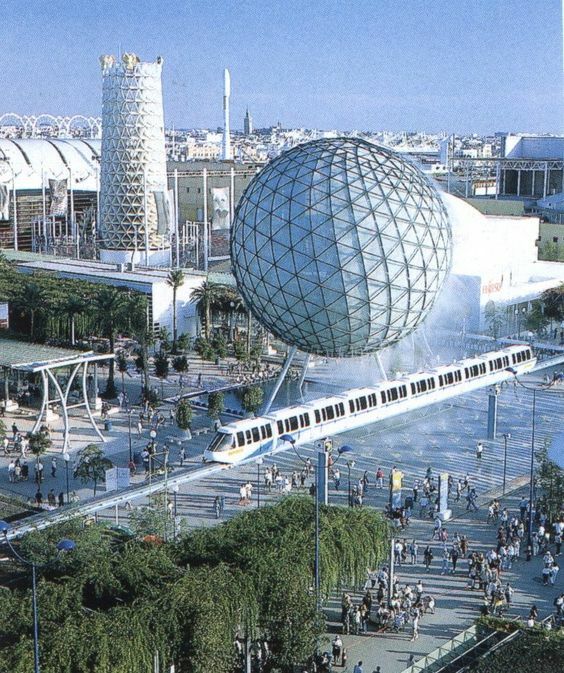 In the late 80s, for the International Expo that took place in Sevilla, the Spanish architect José Miguel de Prada Poole designed the main pavilion for the events in the exhibition area. The “palenque” although resembling the Hajj terminal for the shape of its tensile roof is a much more advanced piece of bioclimatic architecture, Sevilla’s climate can be really harsh during summer and the designing teams put a big effort on the climatic comfort of both the pavilions and the open spaces. 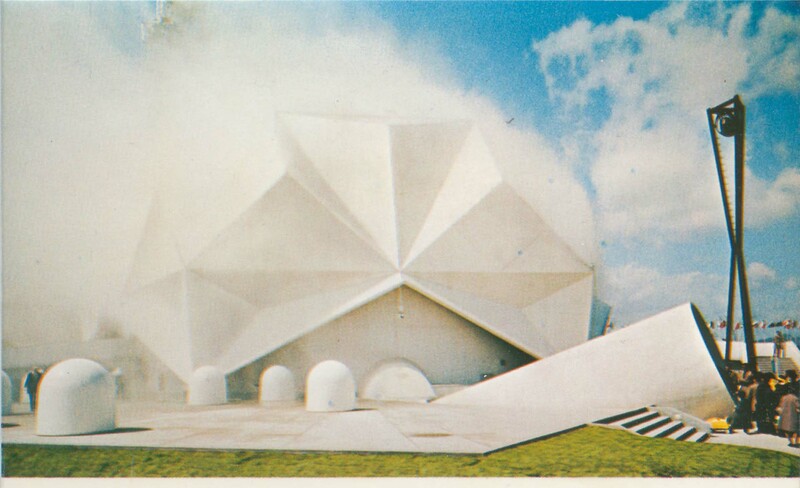 The palenque sits in between a pavilion and an open space, it was the main arena for shows and other events and it was, substantially, a covered open space filled with finely designed mechanisms to guarantee a high degree of climatic comfort even during hot summer days. The design used both natural (the pavilion had no walls at all, only vegetation enclosed it a bit) and forced ventilation and air conditioning to ensure the best possible conditions to its visitors but in this case the most interesting part it’s its cover. 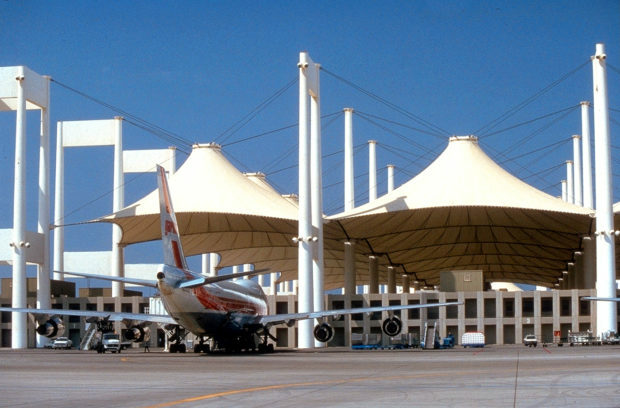 In this project the bioclimatic design of the Hajj terminal was substantially improved, at a smaller scale indeed, the oculus was substituted with an improved ventilation topping cone and to decrease the temperature of the fiberglass fabric under the Andalusian sun hundreds of watering nozzles were installed around the cones. The water vaporizers were computer controlled activating only when the temperature and humidity rose over a certain value, their function was to continuously wet the roof with a fine mist, the quick evaporation of the water subtracted heat from the fabric and contributed to lower the transmitted heat to the underlying arena. But shading can also be declined at a temporary and smaller scale. 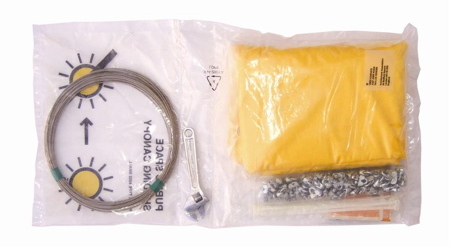 An extreme example, in this sense, is Asif Khan’s Public Space Shadow Canopy Kit, a portable kit that can be easily distributed and installed in any place without any tool or machinery, it can be moved, can be dismounted and installed in another place or can create a successful temporary public space. This extremely low-tech and inexpensive piece of design is particularly meaningful for informal areas, unused or temporary spaces that can easily be converted in playful shaded spaces. 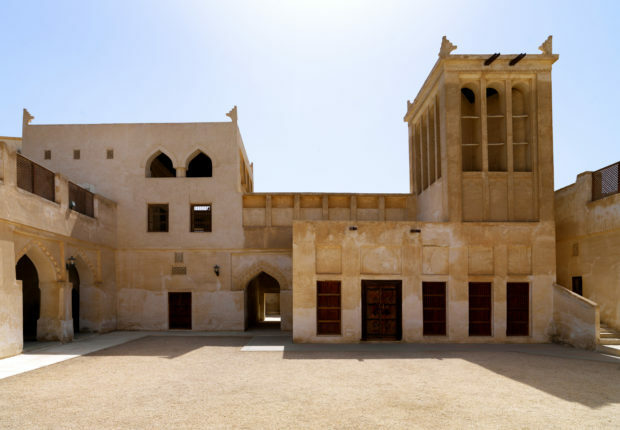 The Bab al Bahrain pavilion is a temporary public space designed by Noura Al Sayeh & Leopold Banchini in one of the most symbolic and historic sites in Manama, Bahrain. The pavilion had an extraordinary success during its permanence and it was constantly used and visited, it held events and even workshops. It’s success can be attributed to a good mix of factors, the first one surely being the special value of the place and the second one the it’s good bioclimatic design based mainly on shadowing. Bab al Bahrain square was one of the main public spaces in the city, very close to the main historical souk and still connected to a natural pedestrian network, it is a privileged place but it slowly lost its status and it has been converted in a roundabout often crowded with cars and very unfriendly for the pedestrians. The first good virtue of this project is the creation of the public space itself, closing the crossing to the traffic and giving back this historical place to the citizens, although it was only for a limited time this demonstrated the power of this kind of intervention and the need for quality public space that this city has. The second important virtue was the design of a comfortable public space using only the perks of the site, a minimal light structure and a low tech element to protect from the sun. 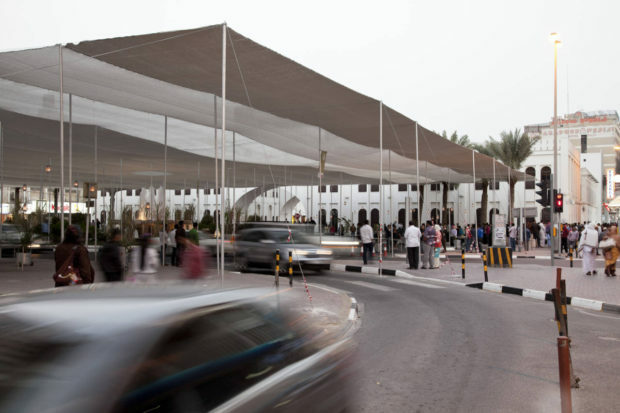 Based on a regular grid of thin steel columns the project is basically made by its “canopy”, a light sun-reflecting fabric (generally used in greenhouses) that reflects most of the energy of the sun giving to the place a nice diffused illumination. To make this design really effective the architects took advantage of a large fountain already existing in the site, the fountain with its fresh water contributes to lower the temperature of the air crossing the pavilion and also generates a cooler spot in the middle of it favoring the creating of a light breeze. 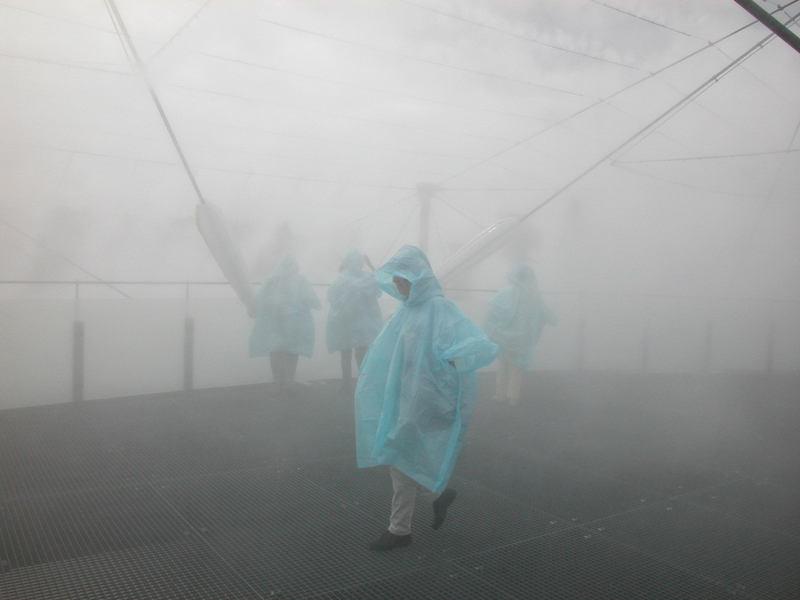 Do you want to contribute to our research about public space for extreme climate? Have a look here. Woody Allen starring in The Front, Martin Ritt, 1976. Copyright of Columbia Pictures. 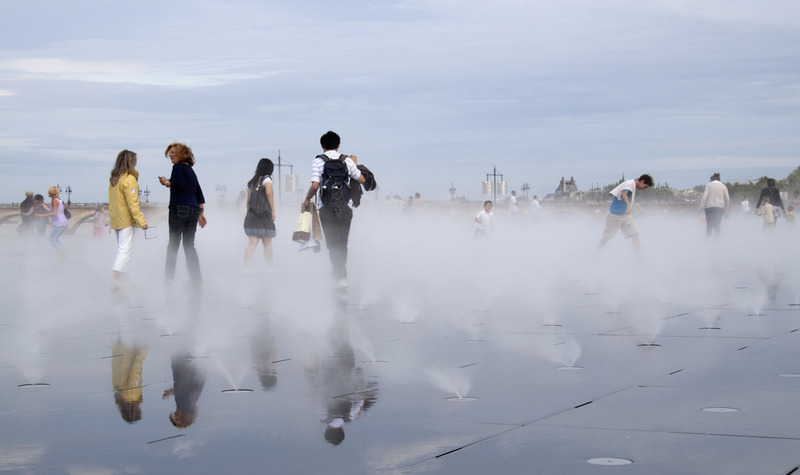 As you may have noticed from our last posts, it has been a while since we have started researching on the possibilities of designing better public spaces for those cities and regions that have to deal with extreme climate conditions. Extreme heat, very often combined with extreme humidity are conditions that, more or less seasonally, affect wide areas of the world. These regions, classified under the Köppen-Geiger climate map mainly as Equatorial and Arid (although with many sub-classifications) comprise various densely populated areas that all face a common problem: the harsh climate, combined with a generic design of the city, results in a scarce and difficult relationship of the citizens with the public space. Our goal is to publish a book that will serve as a design manual and reference for architects, urban planners, public administrators, decision makers, and citizens. This book, containing good practices examples, technical solutions and theoretical essays, will help designers imaging and designing better public spaces considering the local climate, the bioclimatic-comfort needs of the citizens and the responsiveness to the changing environmental conditions. We would like to announce a call for papers inviting authors (architects, urban planners, designers, sociologists, engineers, scholars, etc.) to submit an abstract, no longer than 250 words, for a paper that will be published in the book. The content of the paper must necessarily be related with the topic of the book that can be summarized in the“design of bioclimatic responsive public spaces under extreme climate conditions” and can be either about a general original investigation on the topic or related to a more specific field within the main subject, like for example specific bioclimatic control techniques, technologies or principles, specific open air comfort conditions, the relationship between climate and public space usage, etc. Any other idea, even loosely connected with the main topic, that offers an original and innovative point of view is welcome and will be considered by the editors. The abstracts will be blind reviewed by the editors: prof. Jose Luis Vallejo, prof. Belinda Tato and Marco Rizzetto; they must be written in English and be the result of an original and high quality research. Selected abstracts will be then discussed with the authors to develop the final paper according to the indications of the editorial board, the publication of the paper(s) will, in any case, depend on the quality of the final work. All submissions will be treated as confidential prior to publication in the proceedings; rejected submissions will be permanently treated as confidential. The final book will be both digitally published under a CC-NC-SA licence and made available for download and physically printed, a limited number of copies will be distributed to key institutions related with design and planning all around the world, especially in regions directly interested by extreme climate conditions. The author, or authors, of the selected essays will be credited and acknowledged. For any other information or doubt please do not hesitate to contact us at the address provided below. and stay tuned for upcoming updates. 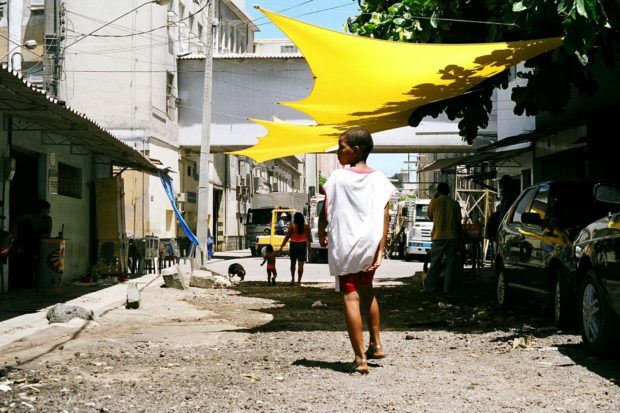 During 2015 spring semester Ecosistema Urbano principals Jose Luis Vallejo and Belinda Tato taught a studio at the GSD in Harvard, focused on the design of socio-environmentally responsive public spaces for the city center of Muharraq, in Bahrain. During the semester the students worked to develop ideas and designs to improve the few remaining public spaces in the city, almost completely wiped out by the continuous transformation of the antique city fabric into a contemporary -and rather generic- one, that basically followed the “wide car street + housing block” development pattern, during the last 50 years the city has completely lost its contact with the water, substituted by a wide belt of highways and also its interstitial, small public spaces, almost completely transformed into parking lots. 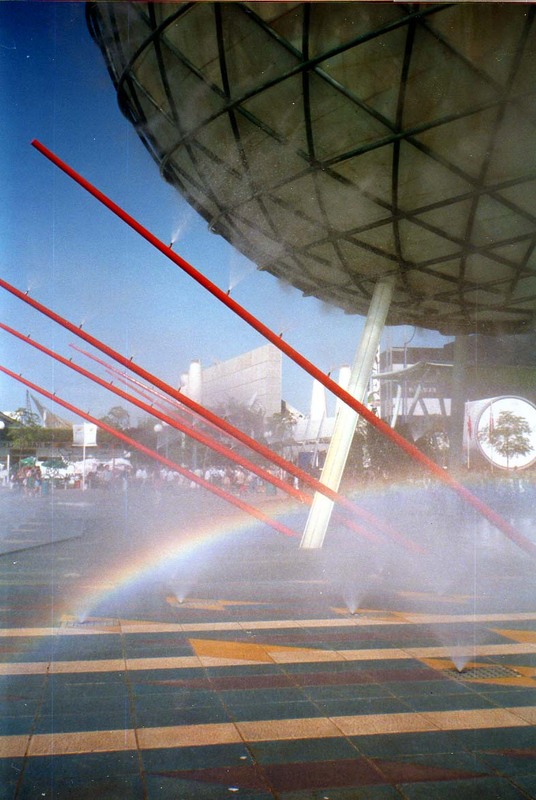 Always considering the climatic conditions that can be easily defined harsh and extreme, the aim of those projects was to foster the use of public space, in a city where public space is not only often abandoned and absent but also where the right to meet and gather is strongly discouraged. Four years ago Ecosistema Urbano held a workshop in Manama, Bahrain, to revitalize and improve the public space around the Bab al Bahrain souk, an area that is historically important for the city but that it is nowadays a mere street crossing rounded by parking lots, without any tree or shadow. 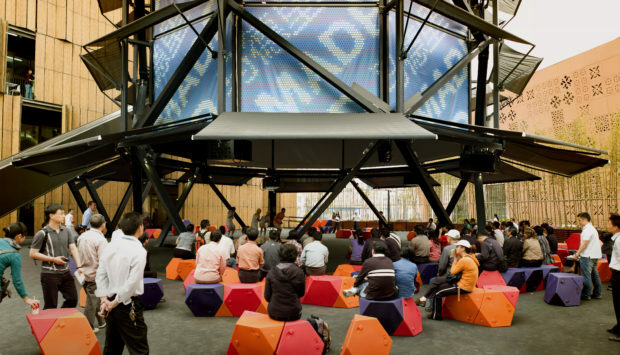 The workshop was held in a remarkable temporary pavilion that for a few weeks converted a roundabout into a vivid and often crowded space, a light textile roof offered shadow and protection to the participants contributing to the success of the workshop. The workshop has been also the occasion for us to start a long term project on Bahrain, under the auspices of the UNESCO Arab Regional Center for World Heritage we started a research project mainly focused on the city of Muharraq, its antique public spaces and how could we revive and improve them. This research has been carried on during 2014 and 2015 spring semesters with the GSD-Harvard students and it emerged immediately that one of the main conditions to make use of the public space in Muharraq was the improvement of the extreme environmental conditions that, combined with a low quality design of the space, prevented and discouraged the people to go out and live the remaining public spaces. Following this same path of research we are now working on a publication to finally release all the knowledge we have accumulated during these years of work, teaching, and research in the form of a book. Our objective is to address the problems that the designers have to face every time they are called to design a public space in an area with a particularly extreme climate (make it extremely hot, arid, tropical, etc. ), we would like to provide decision makers, designers and citizens with a solid base of knowledge to help them consider new technologies and concepts to design public spaces optimized for a certain climate, responding to bio-climatic needs and site specific conditions making it more livable, comfortable and accessible. Beginning today, we start a series of posts dedicated to the design of bio-climatic public spaces, we will periodically publish part of the content we have produced for the book exposing the problems and the good practices that we have found, our concerns, the work of our students, etc. We would like to foster a debate around these themes that might help us developing our book but also raise the awareness around the climatic comfort in public spaces which is a true challenge for architects and designers in many areas of the world.